Women in Finance series: is mentoring the answer to improving women’s career progression? "The mentorship has greatly benefited our business"
Mentoring schemes are not a new idea in business - quite the opposite, in fact. Their benefits - increased confidence and knowledge, better networking, longer-lasting working relationships - are well-known. But in an industry where women still make up just 14% of the executive-level employees, is mentoring part of the answer to improving women’s career progression? This is the second piece of our Women in Finance series, where we take a closer look at the issue of gender equality in financial services - particularly barriers to women’s career progression, based on a report by the CIPD which stated that ‘existing barriers to women achieving senior positions include: perceptions about women’s potential; stereotypes; an absence of role models; careers information and guidance; career breaks; caring responsibilities; full time working being the existing norm; a lack of talent spotting; and a lack of mentoring’. Mentoring is defined by the CIPD simply as ‘a relationship in which a more experienced colleague shares their greater knowledge to support the development of an inexperienced member of staff’. While this definition makes no requirement of a formal arrangement, a number of formal mentoring schemes have made strides in financial services. One such scheme is EY’s 30% Club, which now boasts 2,500 mentors and mentees and 107 organisations. Founded initially to achieve a minimum of 30% representation for women on FTSE 100 boards, its cross-company and cross-sector approach now works to identify the key ‘pivot points’ at which male and female career paths diverge within an organisation and support women at that point through mentoring from ‘seasoned professionals (both men and women) with substantial business experience who hold leadership roles’. Mentoring is one answer - but are we asking the right question? The focus on the moment where a gender split emerges is important - the 30% Club’s ‘Cracking the Code’ report dismisses the myth that child-rearing causes the disparity where men’s attainment leapfrogs that of their female counterparts. The report acknowledges that women notice a ‘deceleration’ in their career progression at the time they start a family but also asserts that ‘at one or two levels below ExCo, the relatively low proportion of women being promoted within a relatively high proportion who choose not to leave suggests that some internal female candidates are being overlooked’. This begs the question - are mentoring schemes placing the onus on women to be better instead of businesses? 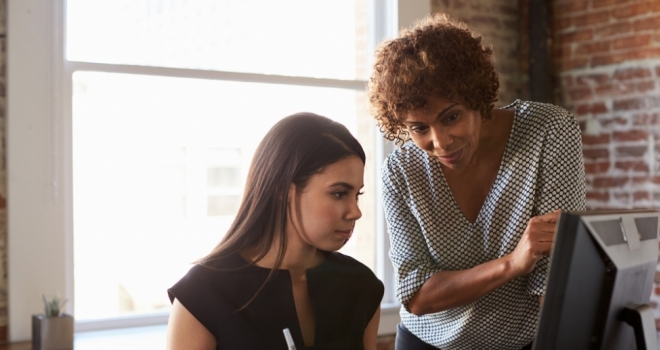 Much of the language surrounding mentoring places emphasis on improving the mentee’s abilities, confidence or - to borrow a phrase from Sheryl Sandberg’s 2013 novel, which discusses mentoring for women in the workplace - capacity to ‘lean in’. So although mentoring schemes aimed at women are there to support their professional growth, it is important to note how they can be a tool to help drive ingrained bias within an organisation too. Another scheme, run by Women in Banking and Finance, also acknowledges that mentors will reap rewards from taking part, as well as their mentees, citing ‘exposure to diverse perspectives, styles, personalities, and cultural backgrounds’ as a benefit of involvement. By encouraging mentoring by all senior leadership team members, regardless of gender, it is possible that previously unchallenged biases might be tackled too. However, as explored in our previous piece on flexible working, it’s impractical to expect small businesses to have the infrastructure to implement large-scale systems to tackle gender inequality - and we aim to explore how smaller businesses can create change, which is where informal mentoring arrangements can shine. Julie Hunt, director of Face to Face Finance based in Norwich, shared her story of mentoring a member of staff for over 7 years. It’s clear that fostering even the simplest of mentoring arrangements - be it time to talk once a week, an open door policy for questions, and knowledge sharing - can create engaged, motivated employees. And, as always, it’s important to note that these benefits are equally important for employees of any gender - and that businesses who create a level playing field through equal opportunities for support for all employees will create a healthier attitude towards asking for help. So is mentoring the answer to improving women’s career progress? It’s possible it’s part of the answer, certainly, but not because it ‘improves’ the women being mentored. Creating a culture where employees of any gender feel comfortable offering and accepting support; building working relationships; helping challenge unconscious gender bias - mentoring has many benefits, intended or otherwise, and even the smallest businesses could reap the rewards.